We are here to serve your favorite foods! We serve breakfast, and offer 2 entrees every day for lunch and dinner. Spoon’s Café serves fresh eggs every day except Monday. We rotate other breakfast favorites throughout the week and weekends. We also serve hearty oatmeal, cream of wheat, breakfast sandwiches, and a little sweet treat every morning! Our lunch and dinner menus change every week but we have favorites on certain days. Tuesday is usually something Italian, Wednesday is Mexican Fare, Thursday is our Hamburger day when we BBQ our hamburgers outside (barring the rain) and you can choose all the toppings you want. Friday is our famous biscuits and gravy for breakfast and our own homemade clam chowder at lunch. 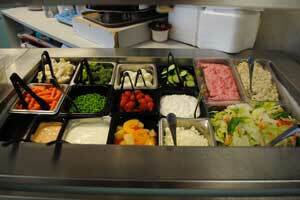 We also have a fresh salad bar with 2 homemade salads, fresh vegetables, 2 kinds of homemade soup, and sandwiches. We offer snacks, fresh homemade desserts, sugar free desserts for diabetics, beverages, espresso, fruit smoothies, and fresh fruit. All our menu items are very reasonably priced! 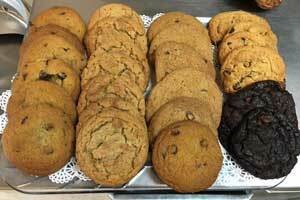 Don’t forget our fresh cookies come out at 2:00pm every day! 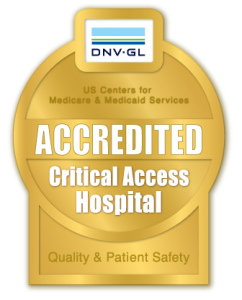 We also serve great food to all our residents and patients that are hospitalized as well as our staff! We serve food to go or to eat here. We also take phone orders! If there is something that you don’t like when you are a patient, just have your nurse call the kitchen. We will serve you anything that sounds good to you if we can! If you want a snack during the day or night your nurse can help you out. There is a large variety of foods 24 hours a day! We are open to the public every day. 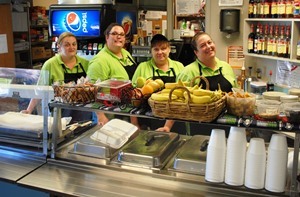 Monday through Friday the Cafe is open at 7:00 am; espresso, coffee, beverages, hot/cold cereals are available. Hot breakfast, including eggs, starts at 7:30 am after we feed the residents and patients. Breakfast ends at 10:00 am. Lunch starts at 10:30 am and is refreshed many times throughout the day and is available until closing at 6:30 pm. There is great food all day long!